For the future transit terminal, see Mount Dennis station. 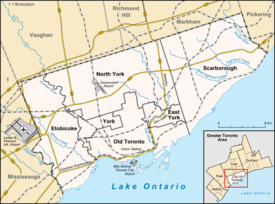 Mount Dennis is a neighbourhood in the York district of Toronto, Ontario, Canada. Primarily located along Eglinton Avenue between the Humber River and the Kitchener commuter rail line, the neighbourhood was best known for Kodak Heights, once a major film manufacturing facility owned and operated by the Eastman Kodak Company. Weston Road south of Eglinton Ave. W.
Aerial view of the Kodak campus in Mount Dennis in 1917. The area gets its name from the Dennis family (led by John Dennis (1758–1832)), Loyalist shipbuilders who owned the property, as well as a boatyard on the Humber, at the turn of the 19th century. It remained largely rural, with orchards, gravel and clay pits and a few market gardens. Kodak Canada moved its factory to a site at Eglinton Avenue and Weston Road, along the rail line running next to Weston Road, in 1913. This factory complex, known as "Kodak Heights", was a major employer for Mount Dennis' residents until it was shut down in 2005. The area became what urban geographer Richard Harris described as an "unplanned suburb" in his book, Unplanned Suburbs: Toronto's American Tragedy 1900 to 1950. Workers at Kodak and the nearby stockyards once located at Weston Road and St. Clair Avenue, as well as CCM, Willys Overland and other factories north and south of Mount Dennis built their own homes before municipal services were in place, and small developers built "infill" homes, gradually filling the streets with the current housing stock of former cottages and small, fully detached homes, among the most affordable housing stock in Toronto for recent immigrants and first-time homeowners. Storefronts along Weston Road in Mount Dennis. In 2014 a public art installation titled Nyctophilia opened at Weston Road and Dennis Avenue. Designed by Toronto artists Daniel Young and Christian Giroux, the piece is part of a series of revitalization projects targeted at supporting the neighbourhood and its residents as it evolves beyond its industrial past. The area is a classic example of Toronto's diversity, with dozens of ethnic groups represented, however the largest ethnic group by far are from the Caribbean and West Africa with the vast majority of visible minorities of Jamaican descent. With respect to religion, there are many black store front churches representing the many faiths of the African and Caribbean communities as well as Western-European, Middle Eastern and Asian faiths such as Christian, Roman Catholicism, Pentecostalism, Seventh Day Adventist), Muslim, and Buddhist. Among the languages spoken are Spanish, Vietnamese, and Portuguese. (Source: Statistics Canada 2006 Census). In Mount Dennis’s census tract 5350156.01, the median income for residents in the community in 2006 as $17,771. This information was collected by the mandatory long-form census conducted in 2006. In 2011, the median income was $20,637. It had grown by $2866. This information was collected by the voluntary National Household Survey in 2011. This demonstrates in general, income levels are rising in Mount Dennis. Data in 2011 was affected by Mount Dennis’ GNR (global non-response rate) of 38.5%. In census tract 5350156.01 in 2006, 600 residents owned their homes while 1590 residents rented their homes. This information was gathered by the mandatory long-form census conducted in 2006. By 2011, 625 residents owned their homes while 1646 residents rented. This information was collected by the voluntary National Household Survey in 2011. This shows residents in Mount Dennis are much more likely to rent than own their homes. Data in 2011 was affected by Mount Dennis’ GNR (global non-response rate) of 38.5%. Dennis Community School is a secular public elementary school on Dennis Avenue, near Weston Road and Eglinton Avenue, operated by the Toronto District School Board. Mount Dennis was founded in 1797. The first Mount Dennis school opened in 1891. Mount Dennis Library is a branch of the Toronto Public Library located in the neighbourhood. The neighbourhood's 60-year-old library, a branch of the Toronto Public Library system, reopened in 2013 after extensive renovations. Located at Weston Rd. and Eglinton Ave. the new facility was designed to be a community hub and is seen by some to reflect the evolving nature of the neighbourhood. In addition to the Toronto District School Board, three other public school boards also operate in the City of Toronto. The Toronto Catholic District School Board (TCDSB), is a public English separate school board; Conseil scolaire Viamonde is a secular French public school board; and the Conseil scolaire de district catholique Centre-Sud is a French separate public school board. The TTC operates several bus lines in the neighbourhood. The Church of St. Mary and St. Martha is visible on the right. Mount Dennis station will be the westernmost terminus of Line 5 Eglinton and a stop on the GO Transit Kitchener line when it opens in 2021. It will also feature a 15-bay bus terminal for local bus routes. The maintenance facility for the vehicles on Line 5 will be on the site of the old Kodak plant in Mount Dennis. When he was a candidate for Mayor of Toronto John Tory's platform included a transit plan he called SmartTrack. The centrepiece of the plan was what he called a 53 kilometres (33 mi) "surface-subway", which would run through Mount Dennis. SmartTrack was to share the rights-of-way of existing rail lines—except for a turn-off at Mount Dennis, where he imagined the route could run parallel to Eglinton, using the right-of-way that had been set aside decades ago for the Richview Expressway. Tory promised that, by the use of existing rights-of-way, this new transit route could be built for a modest $8 billion CAD. Unfortunately Rob Ford, the current mayor, had sold off the Richview right-of-way. This would require multiple tunneled sections along Eglinton, eroding the cost-savings Tory promised. Further, Tory's plan overlooked that the turning radius for large heavy rail vehicles would require extensive tunneling under Mount Dennis itself. In late 2015 Metrolinx made public its plans to include a gas-fired electrical generator on its Mount Dennis campus. ^ a b John Lorinc (2012-11-23). "Down (but not out) Mount Dennis area pins hopes on Metrolinx". The Globe and Mail. Archived from the original on 2016-03-04. Retrieved 2013-03-28. Local politicians are quick to agree that such projects should, in theory, create local jobs, especially in hardscrabble areas such as Weston-Mount Dennis. ^ "Canadian Enterprise Gallery: Kodak Canada Inc". Canadian Heritage. Archived from the original on 2013-03-30. ^ "Employment study proceeding for Kodak lands". North York Mirror. 2008-02-14. Archived from the original on 2013-03-30. Kodak Canada was the largest employer in the area before it left the premises, employing about 800 employees in 2005. Total employment within the study area was 3,409 in 2006 - a decrease of 2,816 jobs over the past 11 years. ^ "Weston-Mount Dennis residents want Metrolinx to preserve last Kodak building". Metro. 2013-05-06. Retrieved 2013-05-22. Mount Dennis is a sort of company town originally with Kodak as the major employer. A lot of people have a strong emotional attachment to it," said Simon Chamberlain, a community activist. "With Kodak gone, this is the one bit of legacy that is left. And it’s one of the few significant historical buildings in the community. ^ Richard Harris (1999). "Unplanned Suburbs: Toronto's American Tragedy, 1900 to 1950". Johns Hopkins University Press. ISBN 9780801862823. Retrieved 2013-03-30. ^ Bayliss, Graeme (July 31, 2014). "Spotted: The Colourful Lights of Mt. Dennis". torontoist.com. Torontoist. Retrieved May 4, 2015. ^ Mitanis, Marcus (July 31, 2014). "New Public Art 'Nyctophilia' Adorns Mount Dennis Neighbourhood". urbantoronto.ca. Urban Toronto. Retrieved May 4, 2015. ^ Hume, Christoper (March 29, 2013). "New Mount Dennis Public Library a neighbourhood beacon: Hume". www.thestar.com. Toronto Star. Retrieved May 4, 2015. ^ Oliver Moorei (2015-11-17). "Western spur estimates raise doubt over feasibility of Tory's SmartTrack". The Globe and Mail. Archived from the original on 2018-06-17. The figure raises new questions about the viability of doing the entire project for the $8-billion Mr. Tory promised during the mayoral campaign. And it is likely to re-energize debate about whether the area would be better served by a previously proposed light-rail line costing billions of dollars less. ^ Rahul Gupta (2012-12-12). "Meeting to provide details on LRT station in Mount Dennis". York Guardian. Archived from the original on 2013-03-29. The Mount Dennis underground stop at Weston Road would serve as the line’s western terminus point, said Metrolinx spokesperson Jamie Robinson on Friday, Dec. 7. ^ Rachel Mendleson (2013-10-02). "Crosstown LRT project reveals — and respects — Eglinton's history". Toronto Star. Retrieved 2013-10-03. But it wasn’t until late last year, when Chamberlain learned the bank would be razed to make way for the Eglinton Crosstown LRT, that he dug a little deeper. As he discovered, the building at the heart of Mount Dennis is in fact deeply embedded in the DNA of the working-class community, with roots tracing back to 1913, when Kodak first set up shop there. ^ Roy Murray (2012-07-09). "Feedback on maintenance yard needed". Weston Web. Archived from the original on 2013-03-29. ^ Rahul Gupta (2012-12-18). "Metrolinx shoots for transit station at Kodak building". York Guardian. Archived from the original on 2014-07-09. A consultant for Metrolinx is confident a historic building on the former Kodak lands will become the main site for a planned light rail transit station for Mount Dennis. ^ Steve Munro (2010-02-17). "Eglinton LRT: Trouble Brewing in Mt. Dennis (Update 2)". Archived from the original on 2013-03-29. Some speakers addressed the use of the Kodak lands for the proposed carhouse, and asked that alternative schemes be considered. Part of this relates to a proposed "big box" development on the land. However, Council approved the acquisition of this property, by expropriation if necessary, in December. ^ Marco Chown Oved (2014-10-27). "The challenges facing John Tory's SmartTrack proposals". Toronto Star. Retrieved 2016-01-09. "Tory acts as if SmartTrack is above and beyond what the province is doing, but it’s not," said transit expert Steve Munro. ^ a b Tess Kalinowski (2016-01-09). "Crosstown gas-fired power plant has Mount Dennis residents fired up: The electrical substation would be a backup facility, but the community wants Metrolinx to use greener technology". Toronto Star. Retrieved 2016-01-09. It would have the capacity to run the entire Crosstown system to avoid peak demand times on the provincial power grid and save about 40 per cent on the price of electricity. It would also generate enough power to run the entire Crosstown system in a power outage, said a spokesman for the agency. ^ Tess Kalinowski (2014-08-26). "Is John Tory's SmartTrack on track for seven-year delivery?". Toronto Star. It gets snarled in development at the Weston end of the tract, but Tory’s campaign says that’s not an issue. A tunnel or elevated section of the line would solve the problem — possibly just a trench such as the one the Yonge subway runs in north of Bloor St.